A river is much more than just the water in it. Water is but one part of the river ecosystem, which is comprised of many interdependent links. The water, the substrate (be it rocks, sand, or sediment), and the aquatic flora and fauna are all intrinsically connected to the plants, animals, and non-living components of the riparian buffer (the zone of vegetation that exists alongside any natural river). Many examples exist: insect larvae and tadpoles which hatch in the river later emerge as non-aquatic adults. Large animals such a deer and raccoons that rely on the river for food to eat and water to drink. The Chicago River system itself is 156 miles long, but its surrounding watershed, the area that drains to it, covers 674 square miles. That's a lot of space that can potentially impact the river, either positively or negatively. The Chicago River's character changes throughout its course. It winds through prairies, woodlands, savannas, wetlands and must also navigate industrial, residential, and commercial developments. Sometimes it is a narrow, natural stream little more than a few inches deep, and in other locations it is a wide, channelized waterway. That the Chicago River continues to be such a dynamic system in the midst of a major metropolitan area is a testament to its resilience. Today, the Chicago River supports hundreds of different species, ranging from large mammals like coyotes and deer to the tiny duckweed, one of the smallest flowering plants on the planet. Through times of modification, pollution, and habitat degradation, the river has maintained its importance as a refuge for wildlife, plants, and even people. Our wildlife pages include information on mammals, birds, reptiles, amphibians, insects, fish, and other small aquatic animals (macroinvertebrates). There is also a page on plants, both native and non-native. 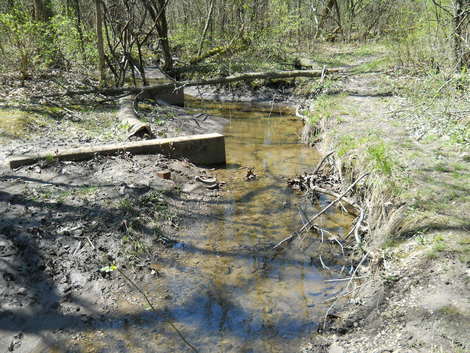 ​Chipilly Woods tributary on a beautiful summer day.